Lessons from Jail by Melinda Inman | Bloom In the Dark, Inc.
Jesus wielded parables powerfully and effectively. In the story of the sheep and the goats, an eye-opening parable defining evidences of true faith, He emphasized the importance of visiting those in prison. There, the need is desperate and aching. And so, because we love Him and those He loves, in a nearby prison our small group of Christian women leads two ongoing Christ-based 12-step programs. There we have learned that women end up in prison for many surprising reasons. There’s always a backstory. It usually involves a man, hard times, and sexual assault. Drugs and alcohol are often involved. But there’s always a deep heart wound. Prison ministry has blessed my life, not only because I am privileged to know these women, but also because in knowing them God has opened my eyes to many truths. I’ve learned lessons about God’s grace that I never even knew I needed to learn. I now have an increasing awareness of my own sinfulness and my utter need for Christ alone. My brokenness doesn’t decrease God’s love for me, rather just the opposite. This fact is life-giving. The women in prison are just like you and me. They need God’s grace, too. If given the same life experiences of most people in prison, we would find ourselves in the same place. That our life experiences have not tipped us that direction is a gift, for we are merely human. We usually fail to understand the depth of our human brokenness. The majority of us are never pushed to the extreme places that tip that first domino, causing one event after another to fall, eventually putting someone into prison. We tend to think we’re far better than we are. We take our good circumstances for granted. We may have grown up in a loving home. We may have had two parents. Our parents probably didn’t teach us to use and deal drugs. No family member raped or assaulted us. No sexual violence occurred right in front of us when we were children. We didn’t witness one parent kill the other. No one placed us in the foster care system. No cruel family member or mother’s boyfriend destroyed our sense of worth, making us an easy victim for a preying pimp, resulting in a life of prostitution. We weren’t kidnapped and trafficked. No unexpected injury caused an agonizing pain from which we could never escape, producing an addiction to painkillers that prompted a crime. We never found ourselves hungry with no money. We never acted desperately and illegally, so our family could eat. We never killed our spouse in self-defense. But things could have gone differently. But for the grace of God, we could be in prison. For those of us who have experienced any of those harmful events, if we have not ended up in prison, it is a miracle, an unexpected gift. Complete and total grace. We’ve learned that around 80% of the women who participate in our program were sexually abused or assaulted, usually as children or young teens. With destroyed sense of self and damaged sexuality, as wounded women they later turned to drugs, prostitution, and other harmful experiences. Why? Because they are human, just like us. When sexual harm occurs at that young age, we often can’t even verbalize what has been done to us, let alone recognize what destruction it wreaks upon our souls. Therefore, we barely understand how we arrived at the broken place we did. The sin that takes root is insidious. It cannot initially be identified: We turn from God. We no longer trust Him. We feel a coldness of heart toward the One who allowed this to happen. From that place come all the other sorts of brokenness. So, Jesus identified with us. In a culture where modesty was the norm, Jesus chose to die stretched out naked and exposed on a cross. His endurance of the shame of this final abuse of nakedness before the world, bodily fluids releasing in death, people mocking Him – all of this was the gift that reaches down into the hearts of sexual abuse victims. It demonstrates His deep love, mercy, and grace to those who find themselves utterly destroyed by the abuse they lived through. The women who come through our Christian 12-step program experience God’s hand as He helps them to understand how their abuse or other damaging life event tipped that first domino, and how the effect of one-after-another seemingly inevitable steps have led to prison. As they work through the program, the grace of God opens their eyes to see how God now utilizes that awful domino effect for their good. It has brought them face to face with the Healer of body, soul, and spirit – Jesus, who empathizes with their experience. God brings them to Himself. Bloom In The Dark, Inc., a 501c3 charity, has donated the book, Bloom in the Dark, to our program. Each traumatized female prisoner will receive a copy. Filling this book are the testimonies of Christian women who have been likewise abused, giving hope for recovery and for blooming into godly women. This is what the women in our program want and need. 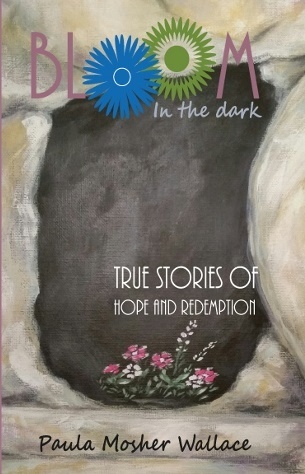 Bloom in the Dark makes it feel as if other Christian women have come alongside the prisoners to meet them in their most wounded place and to help them toward the Light. We’re so grateful for the generous gift. We highly recommend this book and applaud the benefit it brings to broken women. In this book they will read of how God has helped many others to trust Jesus to heal, to overcome, and to grow. Might Bloom In the Dark benefit your own life, program, or ministry? Melinda Viergever Inman was raised in a storytelling family. There her roots were sunk. During years of relocation, tragedy struck. Wounded and heartbroken, Melinda forsook her roots and ran from herself and from God. A journey of trial and heartache brought her home again. A prodigal now returned, she writes with passion, illustrating God’s love for wounded people as he makes beauty from ashes. Fallen is her second novel; Refuge, the sequel, is her first. Melinda shepherds women in prison ministry and writes inspirational material at https://melindainman.com/blog/. With her family she is involved with Mission India/RIMI, rescuing orphans and providing theological and job training for impoverished students.